When you're sailing the seven seas or in the midst of an amazing Halloween party the last thing you want to do is run out of refreshments! 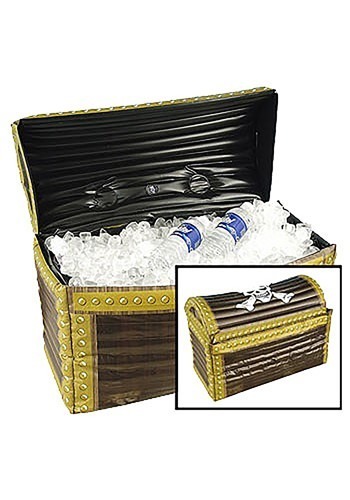 Well luckily, with this Pirate Treasure Chest Inflatable Cooler, that is one less thing to worry about! Once you blow up this inflatable cooler you'll be able to fit in plenty of refreshing beverages for everyone to refuel with before hitting the dance floor again! Bottled water, cans of soda, perhaps a little bit of rum, anything that will quench the thirst of a pirate can fit in this Treasure Chest! This cooler is designed to look like something you'd have to dig up on a deserted island. With the skull and cross-bones symbol on top of the lid of it, this Treasure Chest is the perfect accessory for your pirate costume! While other scurvy sea-dogs may have parrots or peg-legs, you'll be given the title of 'best pirate in all the ocean' when you enter the party wielding this chest! Everyone will want to hear the tale of your adventure to obtain such a treasure. Although we would just suggest that you don't keep any actual treasure in this cooler... without a lock, it may not be there for long!